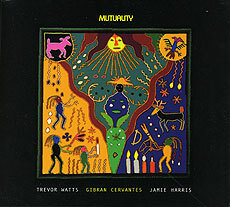 Trevor Watts, saxophones; Gibran Cervantes, urukungolo; Jamie Harris, percussion. Recorded on 30 October 2005 at Pelham House, Lewes, Sussex. Front cover (reproduced above) Peyote spirit, a Huichol Mexican Indian yard painting by Fabian Gonzalez.